Grief is the normal and inevitable response to the death of a loved one. It can affect our feelings, behaviours, beliefs, thoughts, physical health and our relationship with others. It is important to know that there is no timeline when it comes to grief and everyone grieves in their own way. Although grief can be very painful, most people (85 – 90%) find that the support of their family, friends and their own resources, will gradually find ways to live with their loss. However for some, it may be helpful to seek professional support. Penrith Bereavement support group is held at Penrith Bowling Club (Woodriff Avenue) on the 2nd Wednesday of the month at 7pm. Richmond Bereavement support group is held at Richmond on the last Wednesday of the month. For further details please contact 0402 627 696. Supporting those grieving over the death of their partner. Supporting families who have lost someone through drug or alcohol overdose/addiction. The local library has books on grief and there are many available on sale at book stores, eBay, Amazon, etc. I have just listed a few which I have found useful. The internet also provides a wealth of information. The month of August was Grief Awareness Month in the Blue Mountains. 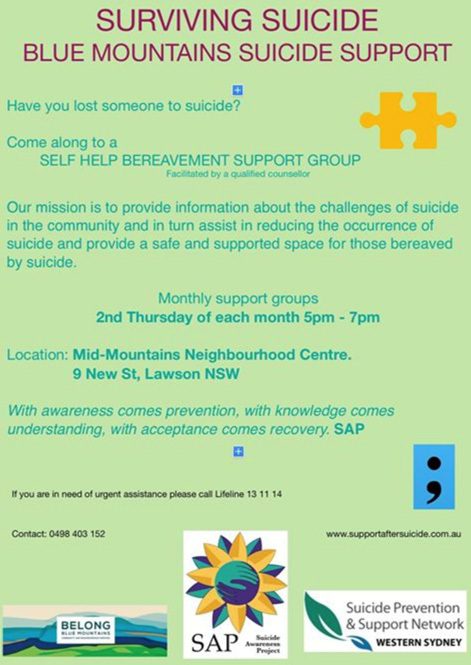 The Mid Mountains Neighbourhood Centre in Lawson held an all day workshop entitled “From Grief and Loss to Renewal” on the 23rd of August, I was able to interview Boudi Maassen who is a grief counsellor on my “Body Mind Spirit Chat” radio show about the workshop and about Grief. The interview is extremely informative and I hope you will find the content useful. ON the 7th of June 2014, Jayne Newling launched her book “Missing Christopher” at the Carrington Hotel. This is the story of Christopher’s shocking suicide at 17 and it’s tragic aftermath for the family. Honest , raw , and deeply moving. Jayne’s account brings to life the visceral experience of grief and the long, painful journey towards finding meaning in life again. Below you will find 3 separate radio interviews. On the 30th of May, I was able to interview Jayne Newling, just before her book launch of “Missing Christopher” on Radio Blue Mountains. On the 10th of June 2014, an interview on the ABC with Richard Fidler and Jayne Newling was broadcasted. August 19, 2014 Ray Hadley from 2GB interviews Jayne Newling. This link provides an extensive list of grief blogs..